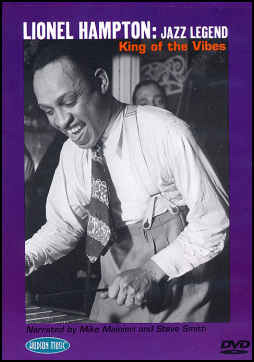 Lionel Hampton was the first drummer I had ever seen juggle sticks while, at the same time, swinging the life out of the drumset. Imagine my surprise when I later learned that Lionel could swing the vibes as much as a set of drums! Lionel was a true musical genius and I'm thrilled to finally see him get his due with this new DVD from Hudson Music called Lionel Hampton: Jazz Legend - King of the Vibes. It features 70 minutes of vintage film clips and rare photos of the man who not only was a great showman and first-rate drummer, but who actually invented the vibraphone as a jazz instrument. The DVD opens by filling us in on Lionel's musical beginnings, learning drums from a nun at the Holy Rosary Academy in Wisconsin which he attended as a child, and leads us up to that fateful day in 1930 when he first played vibes on a recording with Louis Armstrong. The song became a hit and Lionel introduced the vibes to jazz, thus gaining the title "King of the Vibes" in the process. Lionel Hampton was an active and energetic artist for all of his 94 years and, during that time, he played with a wide range of jazz artists from Louis Armstrong to Chick Corea. This DVD contains video clips of many of Lionel's finest performances both on vibes and on the drumset and includes Lionel leading his own band and working with others including Benny Goodman, Teddy Wilson, Gene Krupa, Louis Bellson, Don Lamond, Woody Herman, and many others. From his signature tune of the 1940's "Flying Home" which set the tone for Rock 'n' Roll in the 50's, through his world tour with the selected group of jazz masters he called the "Golden Men of Jazz" in 1993, it's all here on this DVD. And through it all, Lionel seems ageless, energetic, and always swinging. This DVD is a fitting tribute to one of the true musical greats. It contains excellent footage covering Lionel Hampton's incredible 73 year. If you remember Lionel Hampton, I recommend this DVD. If you've never seen or heard of Lionel Hampton, I recommend this DVD. Whether you're into vibes or drums or both, I highly recommend this DVD.